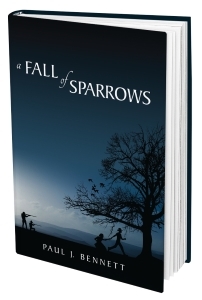 Last night I completed A Fall of Sparrows, the debut novel from Paul J. Bennett and published by Athanatos Publishing Group. It took me a little over a week to read, but a novel of this length I would normally have finished quicker. Easter got in the way a bit. I read the Kindle version, which is available for a steal at $4.99. I would rate the book at PG-13, because of the war violence. There is no profanity or explicit sexual content. Synopsis: In the middle of the American Civil War, a school teacher turned rugged Confederate soldier named Will Seymour has a worldview shifting experience when he encounters a young runaway slave girl named Evaline. Will becomes Evaline’s protector, committed to the mission of escorting her safely through hostile Confederate territory to the North, where she can continue on her way to true safety in Canada. Along the way they counter dangers, many adversaries, and battle constant hunger and lack of supplies. Who Would Like This Book: People who love historical fiction, literary fiction, nature writing, Civil War enthusiasts, people interested in race relations, idealists, and people who like journey stories. If you are a fan of The Outlaw Josey Wales, you’d probably like this book. What I Really Liked About Sparrows: There is much to like, but four things stand out. First, Bennett does a great job with his history. He completely nails the food shortage and scarcity of the Confederate Army, as well as the overall picture of life in Virginia during the war. Second, sometimes the prose soared to superb heights as he described the natural surroundings. To me, it felt at times, a little Thoreauish. Third, Bennett tells a complete story that holds the readers suspense from the first page to the last. Many first time novelists lose their way in the midst of their story, losing the juice of the original idea. Bennett avoid this pitfall by sliding the main characters in and out of new dangers and challenges without changing the nature or essence of the story. Four, I love the idealized way I can read back into the racial and sexual component of the tale. Even though it is historical, the relationship aspects of it are shockingly contemporary. What I Found Difficult in Sparrows: Not much, but there are a couple of things that I didn’t find so pleasing, but these are mostly personal preference issues. One, Bennett uses dialect for Evaline’s speech. I’ve worked with dialect in some of my writings in the past, and know how hard it can be to write, but as a reader, I’ve decided I don’t like it. It distracts from the story instead of adds to it. Second, I think Will’s transformation from one worldview to another is rushed. As a reader, I would have liked to spend more time on that process, and I think it would have taken Will, a life long slaver from Georgia, longer to work through that than the couple of pages afforded it in the text. What I Found Fascinating: It is obvious to me that Bennett loves firearms. Some of the most detailed descriptions in the whole book are about the different rifles, guns, pistols, and such that were in play during the Civil War. Whereas most writers might simply say that, “He loaded his rifle” Bennett gives us a description of the loading action of the individual rifle, its firing mechanism, how the minie ball fired, the color of the smoke, and who in the army might carry that kind of weapon. I also found the brief epilogue fascinating. I can’t tell if it is Bennett telling us as the reader that this is essentially a true story, or if it is a part of the story itself. Final Analysis: I highly recommend A Fall of Sparrows. Previous Post OH NETFLIX, WHY DO YOU VEX ME SO?